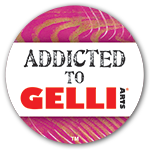 I had a play with something posted on the Gelli Arts FB page, making acrylic skins with Slick paint and gloss gel medium, and it was pretty cool. Not used the scribble version (I did white and black versions but only spread the gloss gel over the white one so far) yet, but I was looking at it and thinking about it and an idea began to form. I thought of a few substitutes. First, freezer paper rather than page protectors (possibly palette paper might work too) for the surface to build the skin on. For two reasons: the freezer paper can be cut (so if you want to cut the skin with it better supported, doing on freezer paper makes sense) and second you can store the skins right on the paper. Second, I thought, OK scribble. Nice but what if….? 1. Cut a bit of freezer paper bigger than your plate. I tried this two ways – both worked, but one produces a thinner more fragile skin and the other a thicker one. 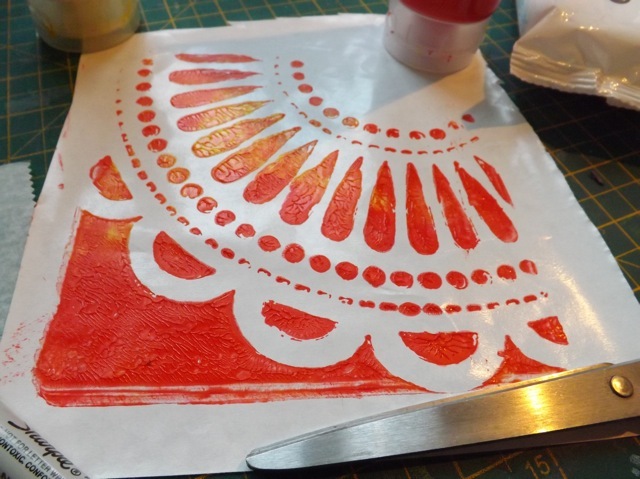 Method 1: do your gelli plate as if for printing. I don’t feel like you need open areas if you don’t WANT them, not for the purposes of creating a skin. The open areas will be transparent (or nearly so) in the end and that will mean when layering it over something else, the something else will show thru. I used just plain old acrylic paint. Tube, rather than craft paint, because my feeling is that the thinner craft paint won’t work as well for the next step. 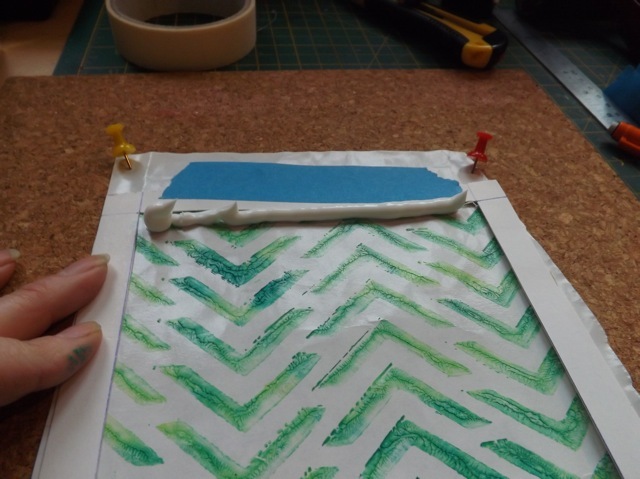 That next step is to carefully pull your print onto the plastic-coated side of the freezer paper. As you can see this IS doable. But you cannot be vigorous in your rubbing. The freezer paper won’t be gripped by the plate, it’ll slide around if you get too aggressive. What I found worked well was to place my hand in the middle of the freezer paper then smooth to one side, then switch hands, hold and smooth to the other side. I think you can see that print above is not too bad. 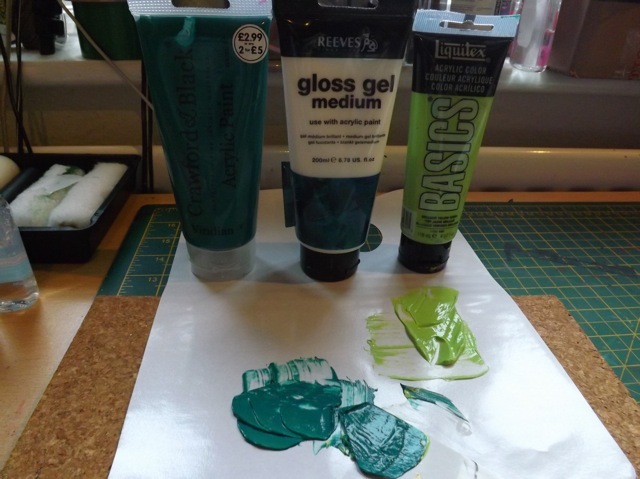 Next, spread on gloss gel medium, all over the print. Be generous and be sure to extend the medium outside the edges of the print. Lesson learned from Method 2 is build up the medium at the edges. Makes peeling it easier! My first experiment is a little thin at the edges. 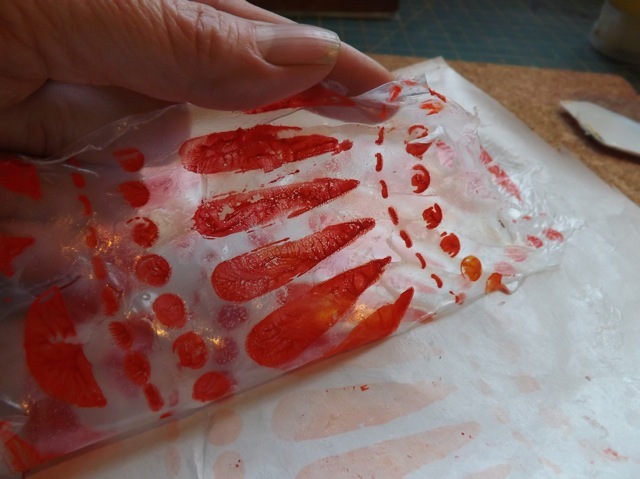 Once it is dry, roll the edges, loosen with your fingernail, but be gentle, slowly peeling the skin off the freezer paper. 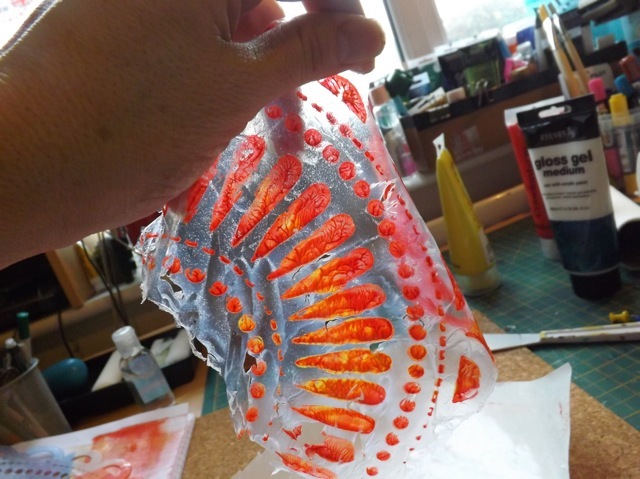 Spreading the gel with a palette knife or brush leaves thinner areas. These can tear thru when you peel the skin off. I’m not sure it matters when you come to stick it down. My gel medium was a pretty discount brand so it didn’t dry totally clear, but you will see later it doesn’t really matter. 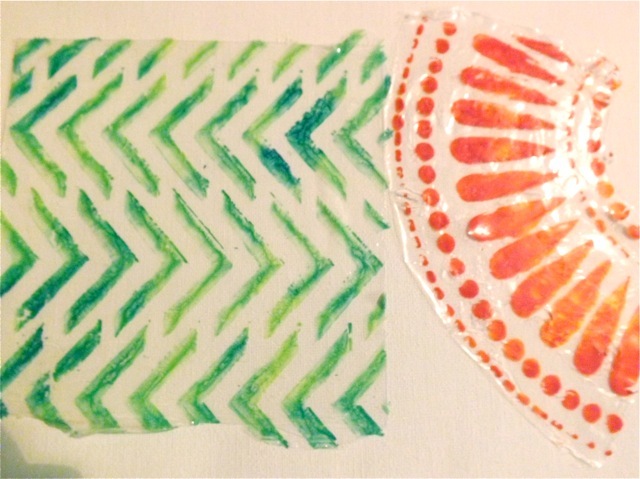 Method 2: do the plate as for printing just like Method 1 but mix in a bit of gel medium to the paint before you spread it on the plate. 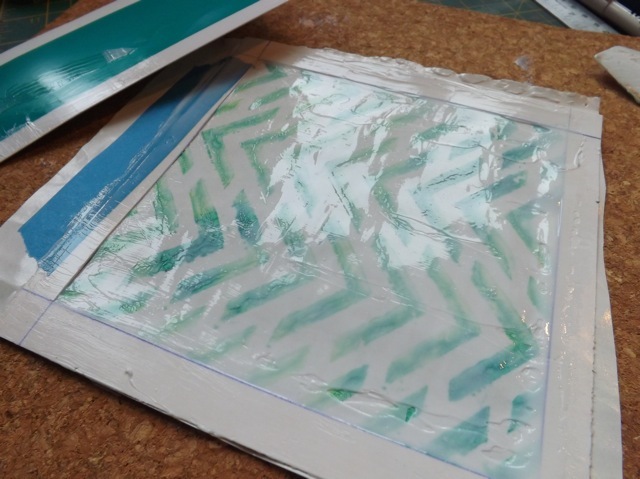 While the print is drying on the freezer paper, cut yourself a frame. Mine opening was about 5 1/2 x 5 1/2 inches for the 6 x 6 plate print. 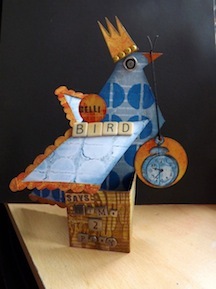 I used cereal box weight card and two thicknesses. I pinned the print flat to a cork tiles I have for stamping. Best buy ever, soooo useful. You can fill in any gaps gently with the palette knife. I added a border of duct tape to the frame, for stability and to make the edges wipe-clean but not till after I took the photos. Let this dry. It’ll take a while. Once it’s dry, peel off the skin. 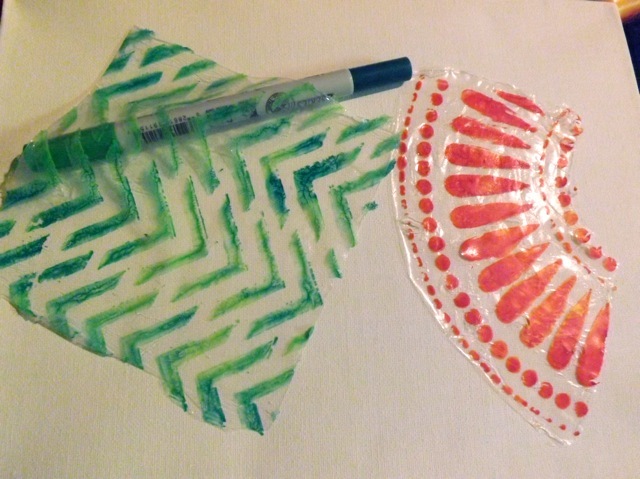 This method uses more gel medium, for sure, but oh my! did it peel off like a DREAM. cutting shapes from the skins with dies – circles seems obvious, but what about letters? Will sandwiching the skin between freezer paper let it cur cleanly? I think it will….. 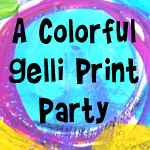 Categories: art, art journal, Gelli plate monoprints | Tags: Acrylic paint, art techniques, Gelli plate | Permalink.